The top question I get asked the most from my Lighthouse at Chelsea Piers wedding clients is "where can we take our wedding pictures?" It's a great question, as Manhattan can be seriously crowded on Saturdays and Sundays! Where can you go that allows you an intimacy to your wedding pictures, while still showing off the city to it's best advantage? Where to take wedding pictures at the Lighthouse at Chelsea Piers? 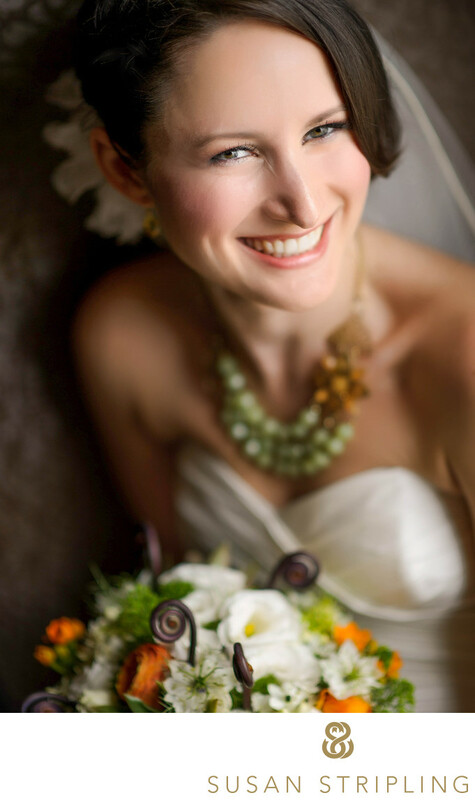 There are several great options, and it all depends on your wedding day and your plans. It also depends on whether or not you want to see each other before your ceremony, which is a decision that you will have to make together. 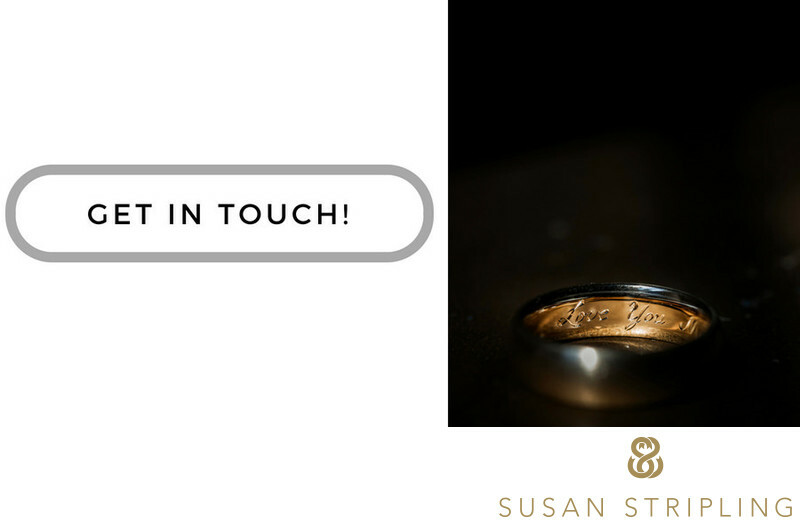 I can offer up the pros and cons of each decision, but ultimately the choice to do a "first look" or not is completely up to you! If you want to stay close by the Lighthouse at Chelsea Piers, we can simply step outside, turn left, and head for the water! There are great walking paths next to the Piers and by the river, which have great light at almost all time of day. It's a great location for family pictures, wedding party pictures, and pictures of the wedding couple together. We can walk along that path as long as time permits, there are great places to stop and shoot for blocks and blocks! Another popular place to go for pictures is the High Line. I especially love the High Line around Little West 12th Street and the Standard Hotel. I love the cobblestone streets right next to the Whitney, and the beautiful city-meets-nature vibe of the High Line itself. You have to understand that it gets very crowded there, especially on the weekends, but if you're willing to venture forth to the High Line, the results are worth it. 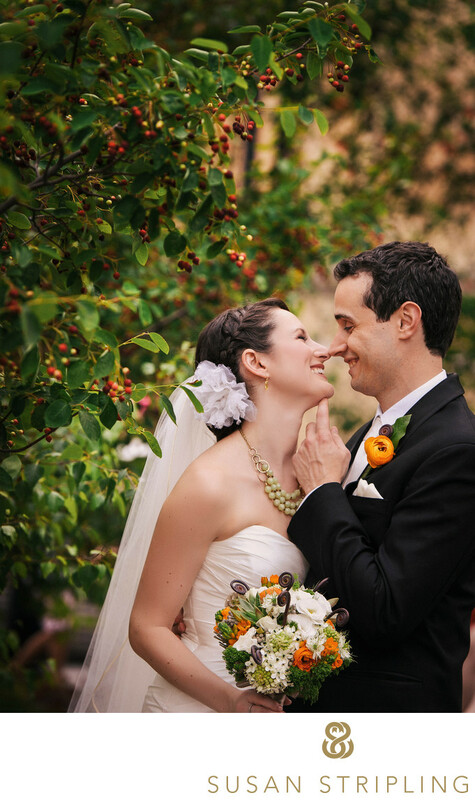 You have to make sure that there is time in your wedding day timeline to leave and go somewhere such as the High Line. I'm glad to help you craft your wedding day timeline to ensure that we have the time we need to go to the portrait locations that you want. So what's the story about this picture? At this 2012 Lighthouse at Chelsea Piers wedding the bride and groom rented a vintage New York taxi from Peter at Film Cars to take them around the city for their portraits. They requested some pictures with this cab, and I was only too happy to oblige. Whenever I have a request to take a photograph of a couple in front of an item, vehicle, or building I try to approach it in a slightly new and different way. We had been at the High Line taking photographs of the bride and groom together, and were getting ready to head back over to the Lighthouse for their ceremony. The cab was waiting for us down at the curb. When I looked down on the cab from the High Line staircase, I knew I had an opportunity to make a creative photograph of the scene before me. 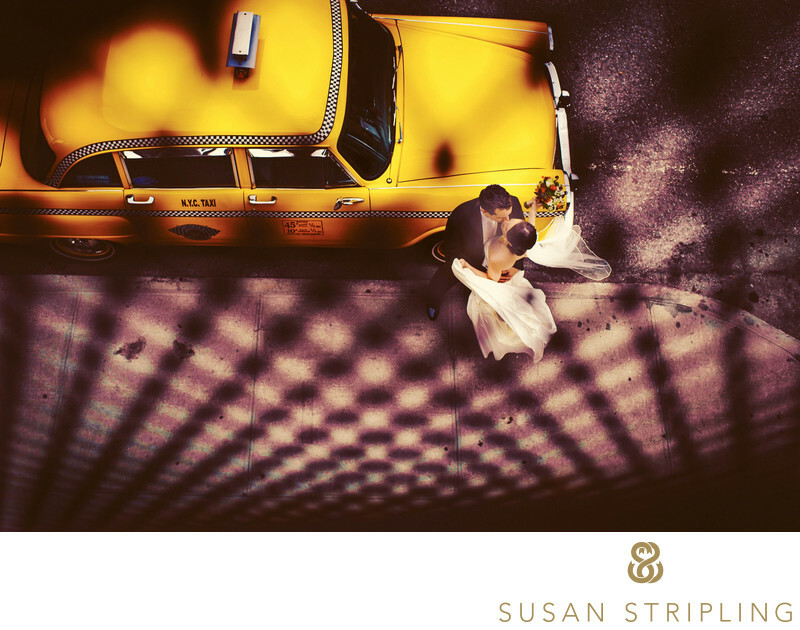 I placed the bride and groom next to the front of the cab, and I climbed the stairs back up onto the High Line. This image was shot through the metal fence of the High Line. I love it that the pattern of the dots lead your eye directly to the bride, groom, and cab. I was thrilled to be able to give the bride and groom something other than your standard picture of them just standing in front of the car! If you're getting married at Chelsea Piers, I'd love to talk to you about your plans! Location: 61 Chelsea Piers #300, New York, NY 10011. Keywords: Lighthouse at Chelsea Pier (63), New York City (207). 1/250; f/4.0; ISO 200; 35.0 mm.